The United States is developing the concept of a "cold war" with Iran. It would be a third way between trying to engage with the hard-line government there and attacking its nuclear facilities with the risk of major conflict. The idea is that regime or policy change could be effected by the Iranian people themselves. However such a cold war might turn into a hot war if Washington decided this approach would not stop Iran from developing the technology needed for a nuclear bomb. Britain is playing a supporting but limited role, with British Foreign Secretary Jack Straw making a major speech on Iran in which he said: "Iran is going in the wrong direction" and "Iran and the Iranian people deserve better." He said: "Our message is that we want the Iranian people to enjoy the benefits of civil nuclear power and we support their aspirations for a freer, more democratic and prosperous Iran." 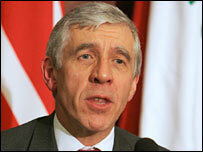 Jack Straw said the Iranian people "deserve better"
This language does not go as far as the developing American policy. Mr Straw says, for example, that an attack on Iran is "inconceivable". But it has echoes of it. And it represents a shift in the British approach. President George W Bush himself heralded the Iran policy in his State of the Union speech in January, when he said: "Our nation hopes one day to be the closest of friends with a free and democratic Iran." That in turn followed his mission statement in November 2003 that he would promote "democracy and freedom in the Middle East". But the policy is also born of political disagreement in the Bush administration about the way forward. The old policy of engagement with Iran has run into the ground. Even its advocates accept that they cannot get round the problem of Iran's method of government. Senior ayatollahs have a veto on reform and blocked reformist candidates in last year's election. At the other end of the spectrum, those favouring military strikes against Iranian nuclear installations are having trouble in justifying a policy which would have huge consequences, adding to the problems the US is already facing in Iraq. The third way is led by the Secretary of State Condoleezza Rice herself. 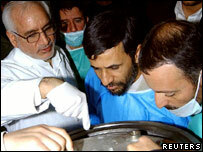 According to the Washington Post, Iran has "vaulted to the front of the US national security agenda". Ms Rice is, like Mr Straw, trying to draw a distinction between the Iranian government and people. "Our problem is with the Iranian regime," she said to senators recently. Iran is already subject to a trade boycott by the US, and as part of the new effort, the Post says, the state department has created an Iran desk, increasing its staff working on Iran full-time from two to 10. There is to be more Farsi language training. Staff are being added in the listening post of Dubai. A $75m (£43.5m) fund has been put forward to help Iranian non-governmental organisations and to increase Voice of America broadcasts from one to four hours a day, and eventually to 24. Congress has cut some of this money, but the thrust of the effort is plain to see. How long Washington might wait over Iran is not at all clear. After all, it took 50 years for the Soviet Union to fall. Nobody really knows how soon Iran might be able to acquire the technology needed for building nuclear weapons. The Israelis have been talking of about a year before Iran reaches the "point of no return", which they define as an Iranian enrichment capability. 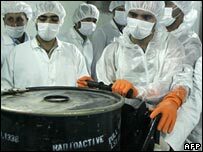 A senior British official also said recently that a year might give Iran time to become skilled in enrichment, but that an actual bomb could be five years away. However, the official offered no technical justification for these statements. The International Institute for Strategic Studies in London issued a report in September 2005 which also said that Iran could, if it went all out, build a bomb by about 2010. But the IISS was at the forefront of those saying that Iraq might have weapons of mass destruction, so it has a credibility problem. And that assumes that Iran would go for a bomb, which it says it will not. The "cold war" approach could buy time for Western policy-makers.